The Liaoning (Varyag) is an ex-Soviet aircraft carrier of the Admiral Kuznetsov Class. Liaoning (Varyag) was commissioned into the People's Liberation Army Navy in 2012. The Chinese aircraft carrier, Liaoning (Varyag), completed its major refurbishment at the Dalian naval shipyard. Image courtesy of Yhz1221. "High-power tug boats were used to tow Liaoning to China. It arrived at the Dalian naval shipyard in northern China in 2002." The aircraft carrier was referred to as Riga when her keel was laid down at Nikolayev South Shipyard (formerly Shipyard 444) at Nikolayev in December 1985. The ship was launched in December 1988 and renamed Varyag in late 1990. After the dissolution of the Soviet Union in 1991, the ownership rights were transferred to Ukraine. The construction had ceased by 1992 due to funding problems. The unfinished vessel sat in the Ukrainian shipyard until 1998, when it was sold at auction to a Macau-based Chinese company for $20m. The company earlier planned to convert the ship into a floating casino, but handed over the vessel to the PLA Navy for refurbishment. High-power tug boats were used to tow the Liaoning (Varyag) to China. Varyag arrived at the Dalian naval shipyard in northern China in March 2002 for a major modernisation and refit. Liaoning was moved to a dry dock at Dalian in early June 2005. The hull was sandblasted and scaffolding raised around her. Her island was coated with a red marine primer to treat the corrosion of the metal. "The flight deck is designed to carry about 50 warplanes including helicopters and fixed wing aircraft." In April 2009, Liaoning (Varyag) was shifted to another dry dock to install engines and other heavy equipment. The superstructure was outfitted with a new radar mast by the end of 2009. The PLA Navy built a full scale logistics and training deck and island mockup of the carrier at the Wuhan Naval Research facilities. The system installation commenced in late 2010. The island of the aircraft carrier was almost complete by March 2011. In July 2011, the Chinese Defence Ministry proclaimed that the aircraft carrier is refitted for scientific research, experimental and training purposes. Liaoning began its maiden sea trial on 10 August 2011. The ship returned to Dalian on 13 August 2011 after completing its first four-day sea trial. The aircraft carrier completed its second set of trials in December 2011. Six sets of sea trials were concluded by May 2012. The ship successfully completed its seventh and eighth sea trials in June 2012. In July 2012, Varyag embarked on her longest sea trials involving landing and take-off of aircraft. The flight deck is designed to carry about 50 warplanes, including helicopters and fixed wing aircraft. 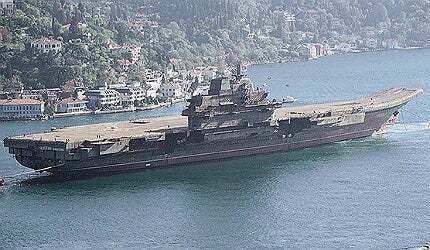 Liaoning (Varyag) was originally equipped with a ski-jump flight deck for launching aircraft. The aircraft carrier is expected to be fitted with an electromagnetic aircraft launch system (EMALS). The system allows the launch of heavier naval aircraft from the deck. Liaoning (Varyag) is expected to operate J-15 aircraft, J-10 carrier based aircraft, Z-8/Ka-31 AEW helicopters and Ka-27 ASW helicopters. The ship can carry 2,500t of aviation fuel for allowing the aircraft and helicopter sorties of 500 to 1,000. The Type 053H3 or Jiangwei-II (Nato codename) is a multi-role frigate operated by the People’s Liberation Army Navy (PLAN). The aircraft carrier is armed with the Flying Leopard 3000 Naval (FL-3000N) missile system and Type 1030 close-in weapon system (CIWS). Anti-submarine warfare (ASW) is supported by ASW rocket launchers. The old anti-ship missile tubes were removed to create more internal space for hangar or storage use. The FL-3000N uses the passive RF/ImIR guidance system. It can engage subsonic and supersonic targets within the range of nine kilometres and six kilometres respectively. The Type 1030 CIWS fires 9,000 rounds / min. Liaoning (Varyag) is equipped with 3D air / surface search radar over the main mask, and four multifunctional APAR (active phased array radar) panels. The countermeasures against hostile threats are provided by the decoy / chaff (24-tube) launchers fitted on the ship.